November ended on a high note for us after winning the first college competition, I entered Paige for the prelim where she did a lovely test getting 67%, for a horse who is scared of her own shadow let alone the white boards I was so pleased with how she performed under the pressure. I then thought we’d have a go at this online showing where you can just send in pictures or videos (not even having to leave the yard!!!) I entered Robbie in a couple of classes and we managed two 1st, 2nd, 3rd and even champion, think this is something we’ll be doing more often from now on! 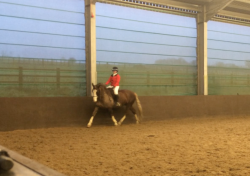 In December I took part in the college dressage again, this time on a horse called Jaffa who I had never actually sat on until 10 minutes prior to us having to be in the ring. We did prelim 7 and with just a few minor slip ups including Jaffa trying to reenact Valegro’s extended trot (I think it’s safe to say this could do with a bit more work), we managed to get 65% leaving us in 3rd which I was thrilled with as I went into it not expecting to be in the top 6 as it was the first time I’d ever sat on him. We also finally have had Robbie clipped so we can now no longer mistake him for a polar bear but he actually looks like a horse again, even if he was a pest and took almost 3 hours to do! Thankfully he settled once he realised if he behaved he could have his lick. All in all I’m really happy with how this year has turned out, it’s had its ups and downs but I couldn’t be more pleased with how all the ponies have performed throughout. Annoyingly we didn’t get out as much as we planned as things got in the way but we made sure to make them winning trips when we did manage to attend some pony parties, and now heres to the next few months of hunting fun! I couldn’t thank everyone enough for all the support I’ve had over the year, including the opportunity from Horslyx which has been such a great experience! I hope everyone has a lovely Christmas and new years, and wishing you all the best of luck for 2017! Make sure to make it your year!